noted: Anyone for a pun? Water palavar! 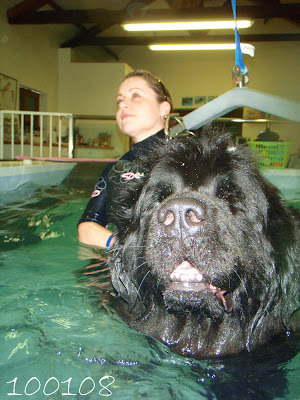 So this evening was Lolas first time back at hydrotherapy after her last (and hopefully it will be her last!) op. She was very good, with just enough splashing to wet me through! So in honour of that, my pic of the day is her in the pool! It's not an amazing shot, but it was taken with my little waterproof camera and think it did pretty well! You can nearly see Newfy brain, right up her nostrils!! With Lola is Lisa from the very fantastic Dorset Aqua Dogs. Lola loves Lisa and Suze, especially when she gets her after swim bath and blast! !